Indoor recess can be very stressful if it happens for several days in a row. This is where active classroom games can be helpful. Children need to be active, but without some routine or structure, behavior problems can occur. Supervising and monitoring activities can be difficult, especially if the home room teacher is not there. Once the supervisor knows the games, they can help the children engage in fun physical activities without worries. When are some other times that active classroom games are helpful? Active classroom games for kids are helpful for many other times during the day. They are great brain breaks when people are getting sleepy and need to wake up their brains. They also work well for daily PE when the gym isn’t available. Try using them when transitioning from one lesson to another or when you have a few minutes to fill during the day. In my school, there were too many classes to fit gym time in every day, but we were required to do daily physical activities with the children. This could be tricky at times, because the classrooms are not very big and kids moving around can be awkward. My students got really good at moving desks to the side quickly so that we would have a larger space for activities. If the weather was good, we would go outside on the field to play some games, but we live in an area where it is raining a lot of the time, so we would have to stay inside. How often should active classroom games be used? Active classroom games should be used a few times a day so that the brain stays alert and the children can learn better. The games can be short and simple. Just standing up and stretching works, but using games is more fun and engaging. Here are some active classroom games that work well and don’t require a lot of equipment. The circle games work well in small spaces. Large spaces work better for the running games. Try some of them in the gym. Grab your free copy here. I hope you enjoy many active moments in your classroom. Have fun. Brain Breaks for Back to School and Beyond! Need Some Indoor Classroom Recess Suggestions? 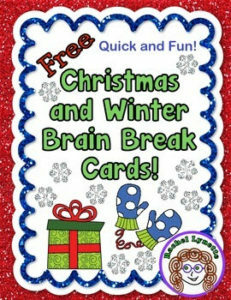 Brain Breaks for Christmas and Winter! Hello everyone. I am Charlene from British Columbia, Canada. I am a retired primary teacher, former French Immersion music teacher, mother of 4, grandmother of 8. I love working with kids and continue to volunteer with reading groups and small math groups at school. I also teach ukulele to both children and adults. I tutor some students at home in math and French. I am also known as Diamond Mom and I have a blog called Diamond Mom’s Treasury. I enjoy creating materials for students and I have a TeachersPayTeachers store where these materials are available for others. You can also visit me on Facebook, Pinterest, or Instagram.